The image above shows employees of the Cleveland, Cincinnati, Chicago and St. Louis Railway Company, also known as the “Big Four.” This railroad was formed in in June of 1889, by the consolidation of several railroads. Railroads have been important to Sandusky, because of the many jobs they provided, and for allowing a wide variety of raw materials as well as finished products to be transported in and out of the region. In the 1890s, the passenger depot for the Big Four was located on the north side of Water Street east of Lawrence Street. The shops for the Big Four were situated on the city’s west side, east of Harrison Street, and just north of Adams Street. These views from the Sanborn Insurance Map of 1893 give an idea of the layout of the yard. In the view above you can see the turntables, which allowed for railroad cars to be moved in and out of the various wood shops and machine shops. Skylights illuminated the carpenter’s shop and the locomotive works. 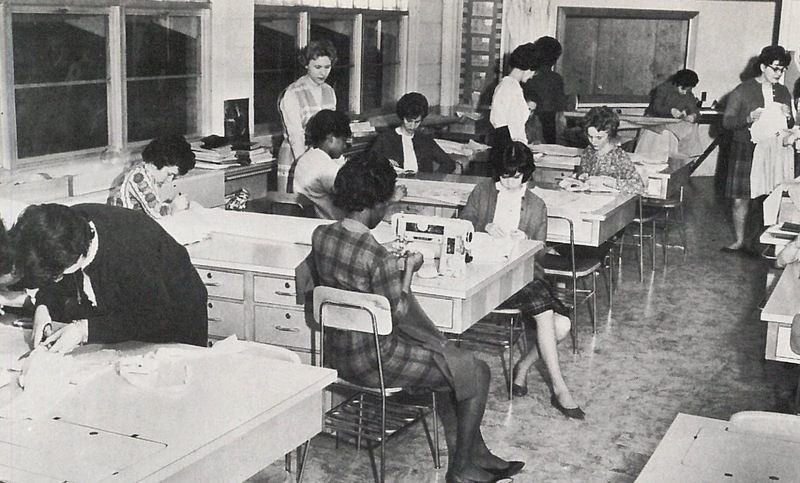 Other shops included the pattern loft, machine shop, and wood planing shop. A blacksmith’s forge was onsite so repairs could be made to hardware related to the railroad cars, doors, and boilers. 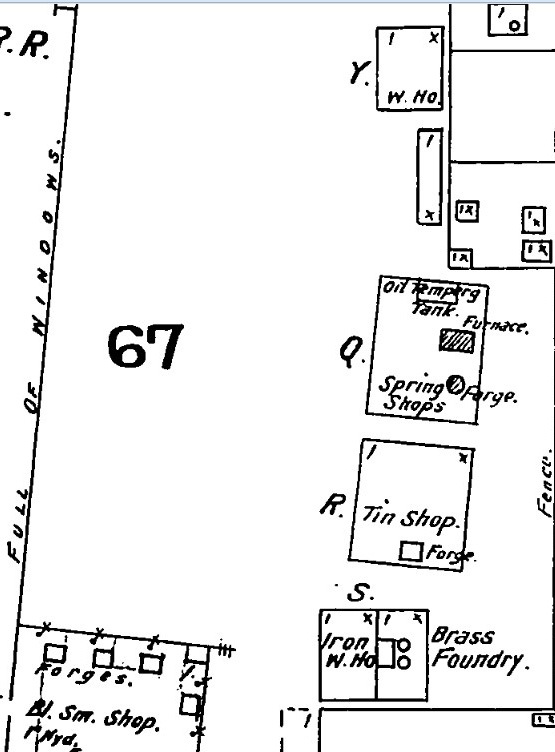 A large lumber yard was adjacent to the carpenter’s shop. 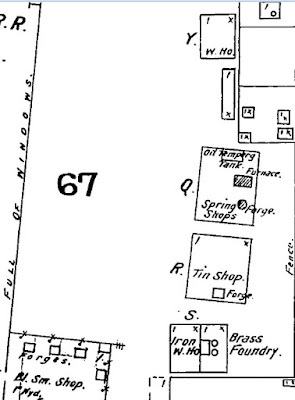 To the west of the main shops were smaller buildings which housed the brass foundry, tin shop, spring forge shop, and wood house. 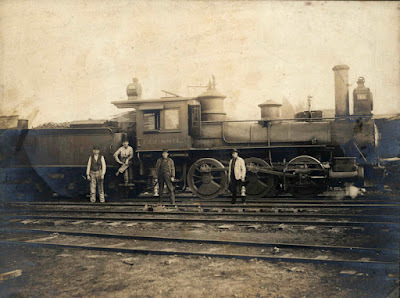 It took a large number of skilled workers to keep the railroad cars and boilers in good working order in the nineteenth century. 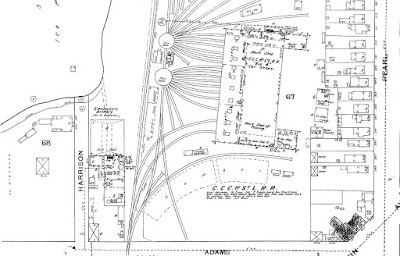 The 1893 Sanborn Map helps us to clearly see the many different aspects of this operation. 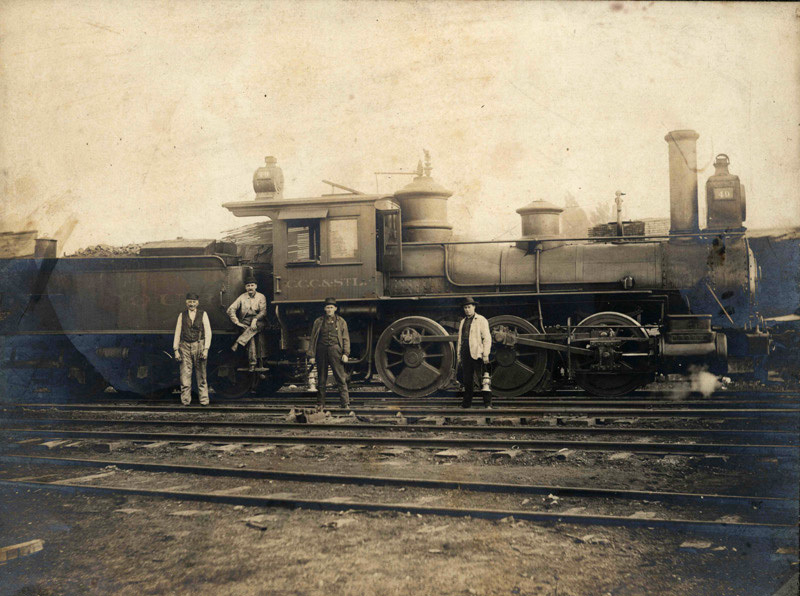 Railroads were a key component to the infrastructure and economy of Ohio and the nation. 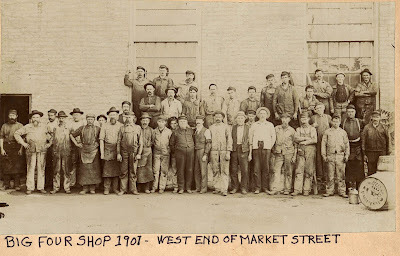 Below is another photograph from the historical collections of the Sandusky Library Archives Research Center which features of a large group of employees of the Big Four in 1901. It appears that at that time there was a Big Four shop on the west end of Market Street. 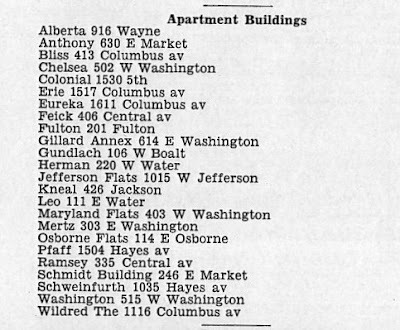 Though not all the apartment buildings are still in existence, many of the named apartments buildings listed in the 1941 Sandusky City Directory are still providing homes for Sandusky residents. Pictured above is the Ramsey Apartment building located at 335 Central Avenue. The Erie Apartments at 1517 Columbus Avenue were built in 1919 for employees of the Erie Tire and Rubber Company. 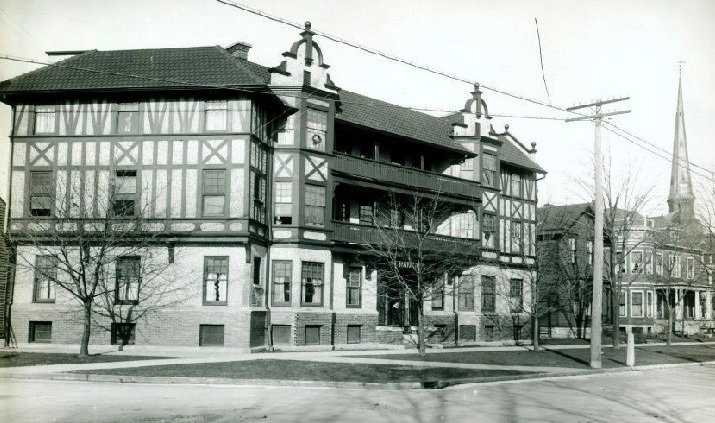 Though the company was only in Sandusky for a few years, the apartment building still stands. The apartment building at 515 West Washington Street was once the home of the William T. Townsend family. 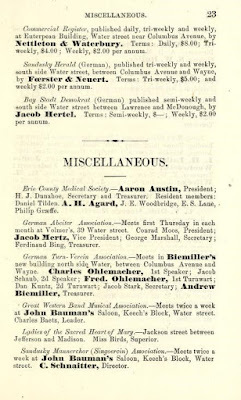 Mentions of apartment buildings often appeared in the society pages of the local newspapers. 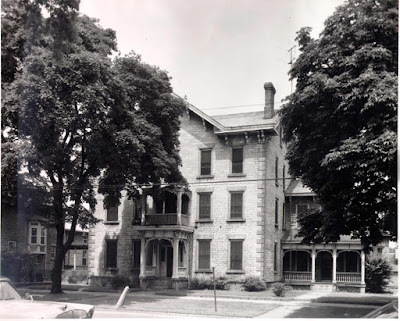 The Sandusky Star Journal of March 28, 1911 reported that Mrs. John Renner had recently been hostess to the Fortnightly Club in her apartment at the Feick Flats, and Mrs. W.H. 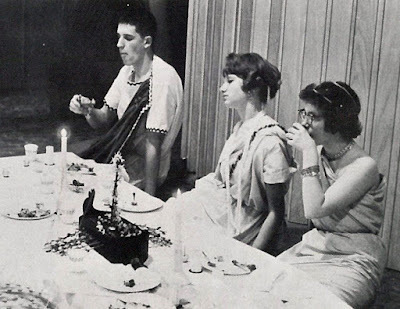 Nolte served an elegant lunch when the L.G.A. met at her apartment at the Willdred. 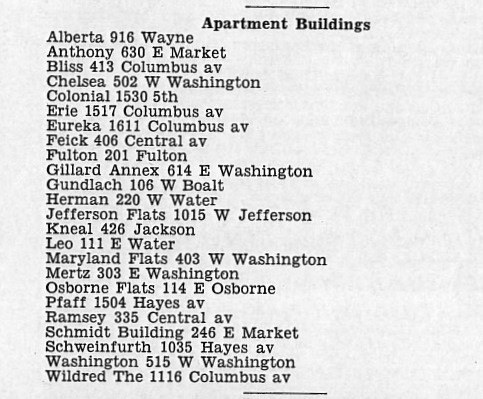 At least two of the buildings from the 1941 listing have been named to the National Register of Historic Places, the Willdred Flats and the Mertz apartments. The apartments at 310-303 East Washington Street were listed as the Converse-Mertz Apartments in the National Register. 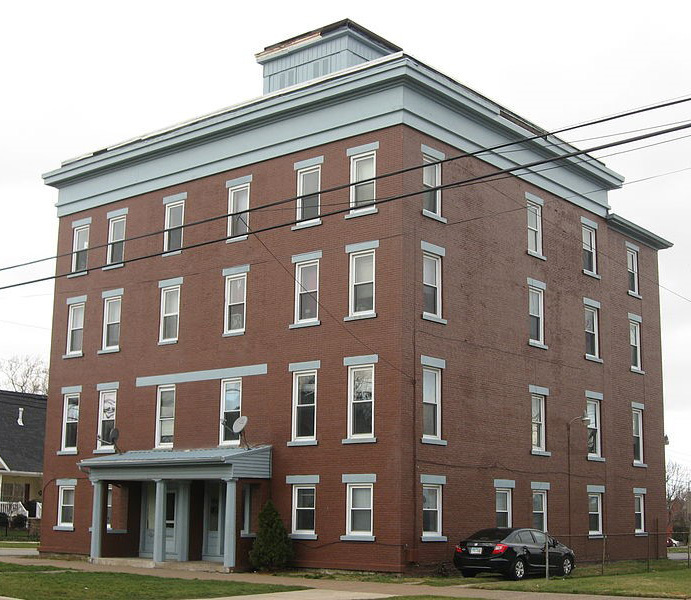 According to the Ohio Historic Places Dictionary (Somerset Publishers Inc., 1999), the Greek Revival style apartment building was built by Charles Converse, an early dry goods merchant in Sandusky. Andrianna Van Deusen purchased the property about 1867, and ran it as a boarding house. 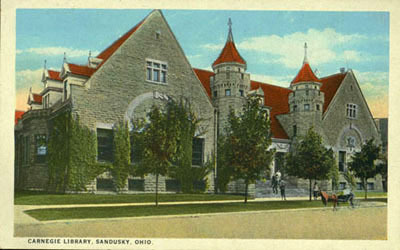 Sandusky businessman John Mertz purchased the building in 1912 and remodeled it. The property remained in the Mertz family until the 1960s. Of course today, there are many more choices in apartment living in Sandusky, including several high rise buildings, and the recently converted buildings such as the Cheapeake Lofts and the Rieger Loft. 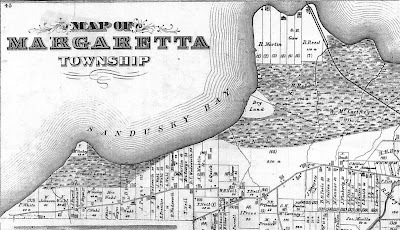 Visit the Sandusky Library, to view historic Sandusky City Directories, to learn more about the residents of our city in years gone by. From about 1864 through 1871, there was a brewery on Harrison Street, just north of Adams Street, run by George Soergel, Philip Dorn, and Paul Raible. 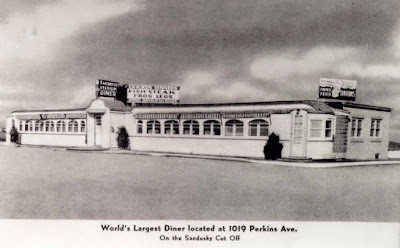 Though this business was in operation for less than ten years, there are interesting facts we can learn about the company from the City Directory for Sandusky, as well as the 1870 United States Census. 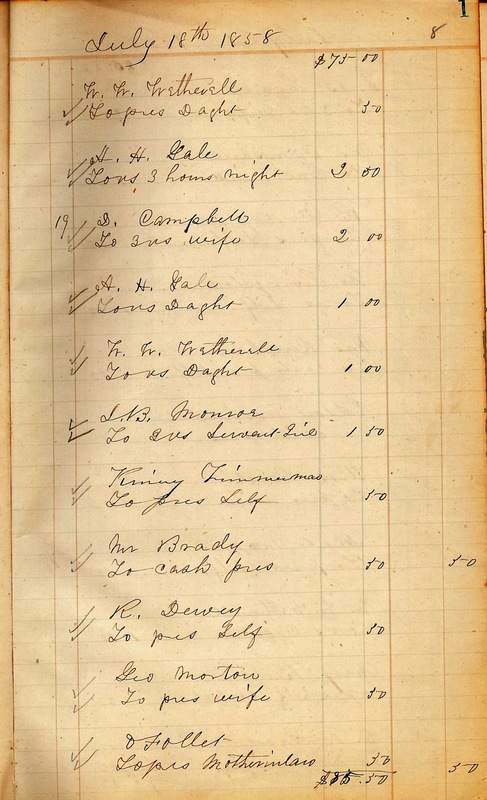 By doing a search for the surname Dorn in the 1867 McKelvey Directory for Sandusky, we find out the names of several employees of the company. 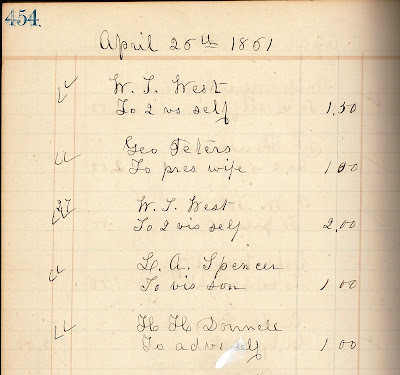 In the 1870 United States Census, the families of George Soergel (spelled Sorgel in the 1870 census enumeration), Philip Dorn, and Paul Raible were listed all together in the same neighborhood in the Fifth Ward of the city of Sandusky. 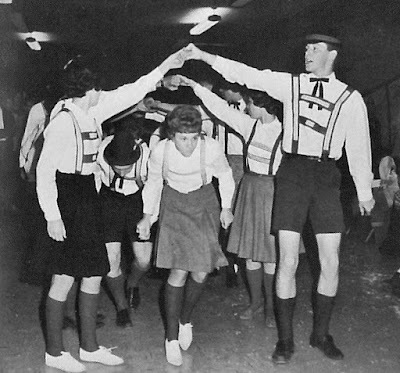 George Soergel was age 52, and was born in Bavaria, Germany. He was married to Catherine, and they had four children living in their household, ranging in age from 5 to 17. Philip and Margaret Dorn, ages 42 and 32, were also natives of Bavaria. Their children were ages 5 and 8. Paul Raible, age 35, had been born in Prussia, while his wife Christina, age 26, was a native of Württemberg. The four youngsters in their household were all under age 5. By looking at the image of the trade card from Soergel, Dorn and Raible, we can surmise that the lagerbeer and ale that was created at the company was distributed by railroad cars. 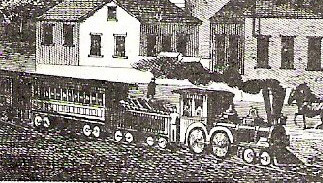 Deliveries were also made by horse drawn vehicles. 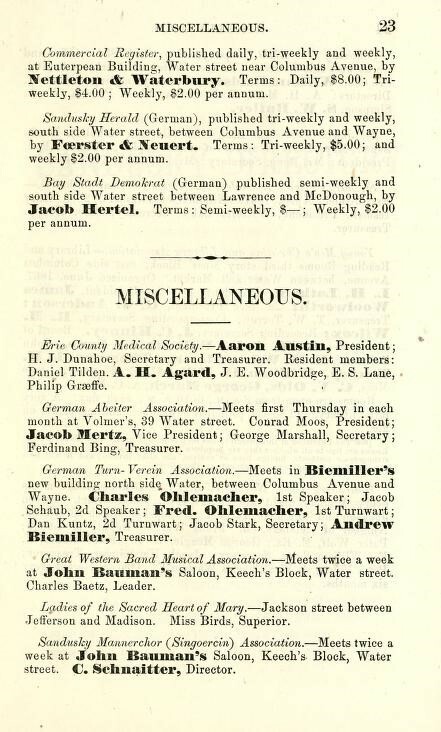 On page 23 of McKelvey’s Sandusky Directory, we see that there were several German social and musical societies to which the proprietors of Soergel, Dorn and Raible may have belonged. There was even a German language newspaper at that time, the Bay Stadt Demokrat. 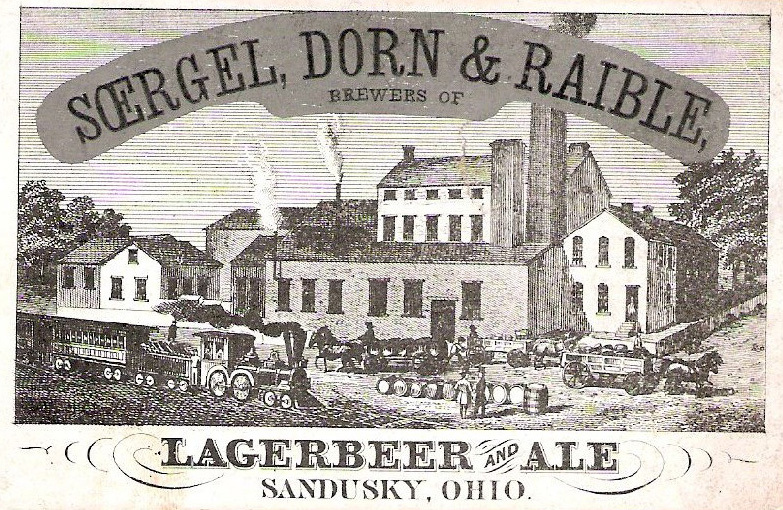 By 1879, Anthony Ilg was running a brewery at the former site of Soergel, Dorn and Raible. 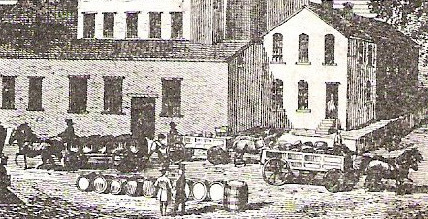 In 1905, the Diamond Wine Company and Lake Erie Wine Company were in business at this location. In the 1910s, the Easiest Way Manufacturing Company made washing machines here. In 1942, the Peerless Stove and Manufacturing relocated from Columbus to the northeast corner of Adams and Harrison Streets in Sandusky. If walls could talk, the walls of these buildings would have many stories to tell! This view of the dance floor at the Pony Tail appeared in the advertisement section of the 1967 Sandusky High School Fram. 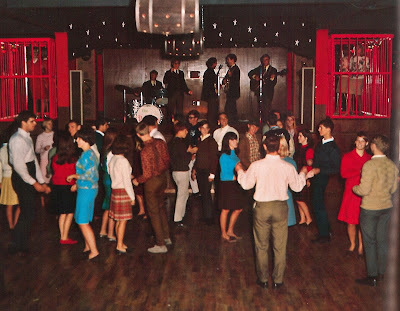 In October of 1966, a Greyhound charter bus picked up teens at the Pony Tail on Saturday nights at 8 p.m. and took them to the Note in Ruggles Beach. 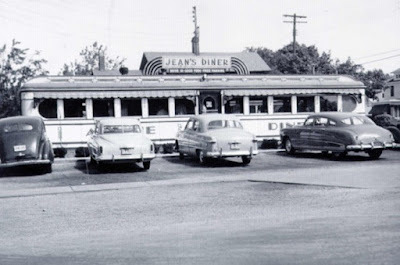 The bus returned at midnight, and the fare was fifty cents. 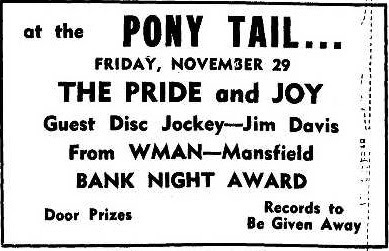 Bands usually played on Friday nights at the Pony Tail. 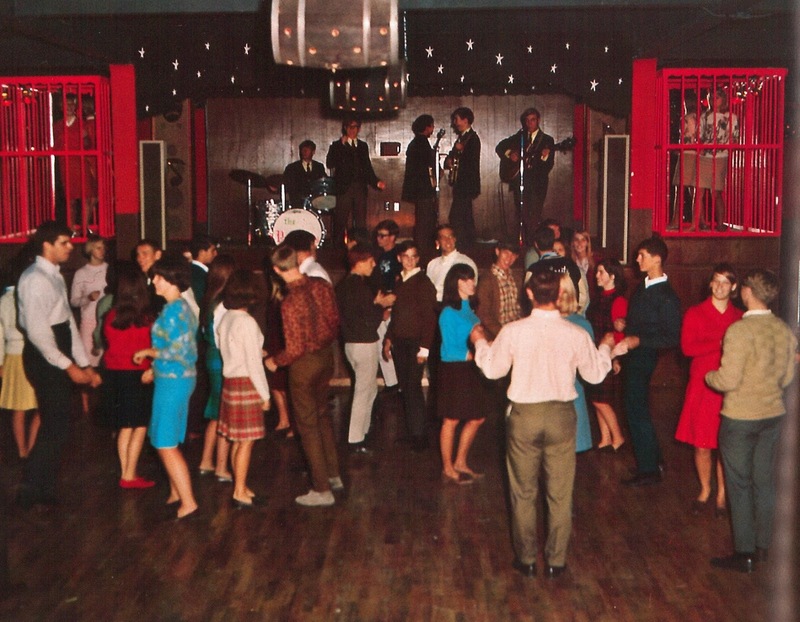 The Choir sang their hit song “It’s Cold Outside” at the Pony Tail in the spring of 1967. 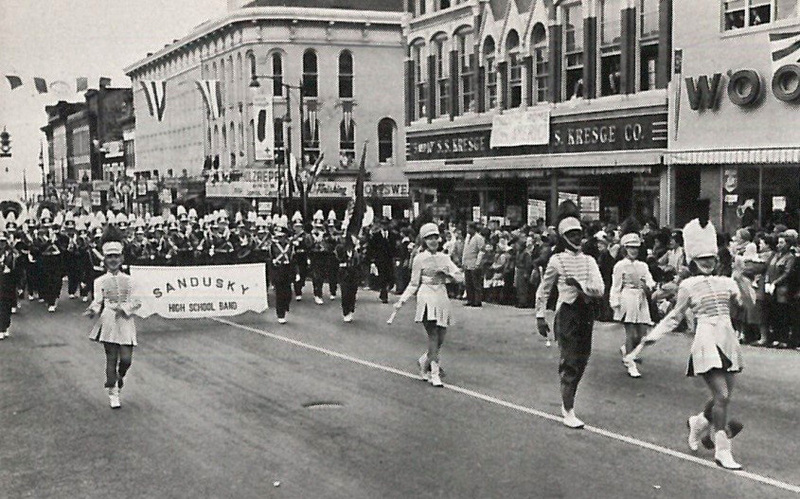 A staff member of the Sandusky Library recalls hearing the band play there. She stated that the Pony Tail was a fun place to meet young people from lots of other schools in the area. 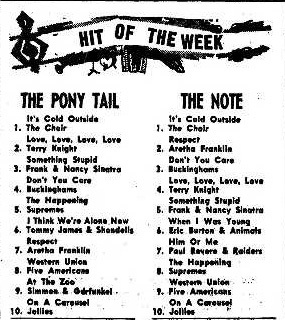 The advertisement below listed the top hits at both the Pony Tail and the Note in the May 3, 1967 issue of the Sandusky Register. 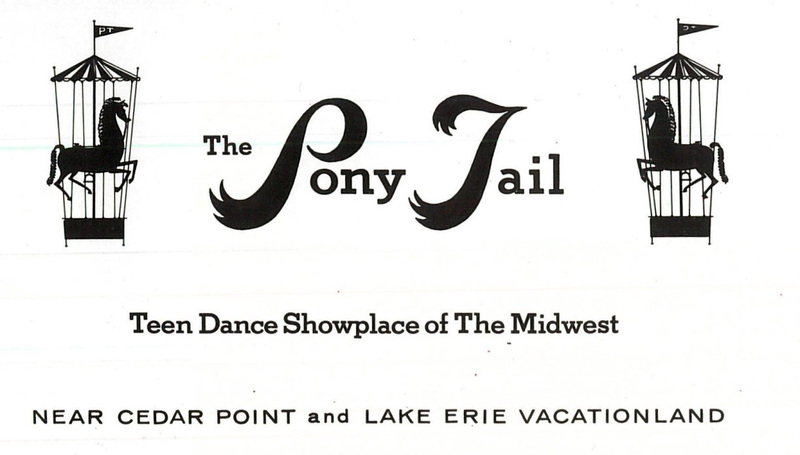 The group known as the Music Explosion (from Galion, Ohio) played at the Pony Tail in September of 1967. They were best known for their recording of the song Little Bit of Soul, which reached #2 on the Billboard Hot 100 Chart in that same year. 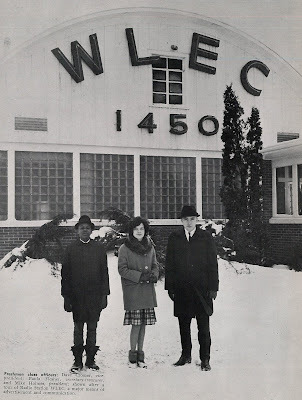 By March of 1969, the First Presbyterian Church had purchased the building to be remodeled to house Christian education and fellowship facilities for the church. Care and Share of Erie County is now located at the site of the former Pony Tail Teen Club. 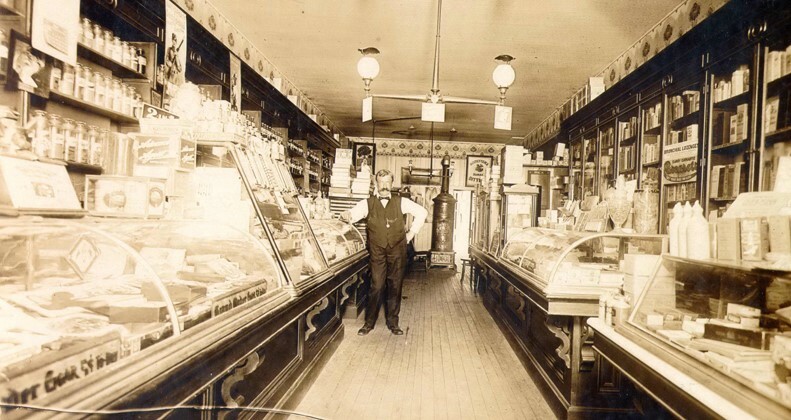 Here is an undated photograph of Ramm’s Meat Market in Sandusky, Ohio. The market looks neat and clean -- perhaps the photo was taken when the business location opened.You can see scales and meat cutting equipment behind the counter. 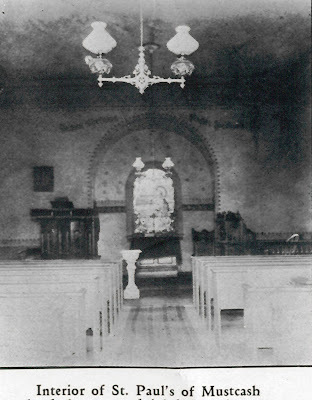 Note the embossed tiles along the walls. 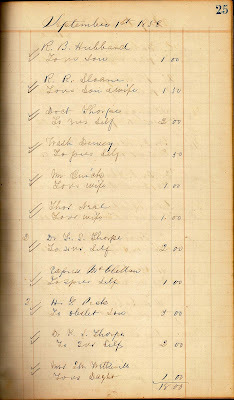 The Ramm family resided at 1023 Tiffin Avenue, next to the meat market at 1021 Tiffin Avenue. On July 6, 1934, Bruno Ramm died at the age of 61. 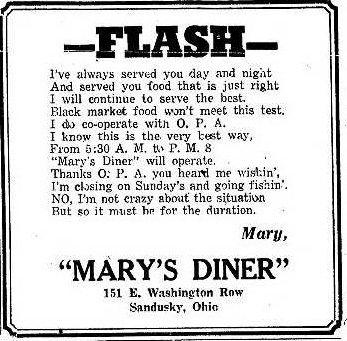 An obituary for Mr. Ramm, which appeared in the July 7, 1934 issue of the Sandusky Star Journal, stated that Bruno Ramm was one of Sandusky’s best known men and he had been engaged in the butcher business in Sandusky all of his life. Bruno Ramm was survived by his wife, a daughter, a grandchild, as well as a sister and brother. Mr. Ramm was buried at Sandusky’s Oakland Cemetery. 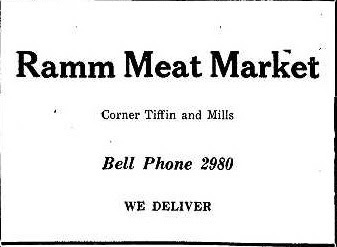 From about 1941 to 1952, George Polta ran a meat market 1021 Tiffin Avenue. In the 1960s, Zam and Cousino Florists was in operation at the site of the former Ramm Meat Market. 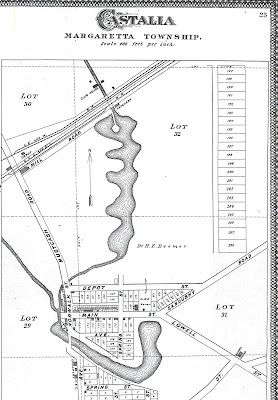 According to The History of the Fire Lands by W. W. Williams (Leader Printing Co., 1879), the area known as Mustcash or Muscash was located in the northwest section of Margaretta Township in Erie County, Ohio. 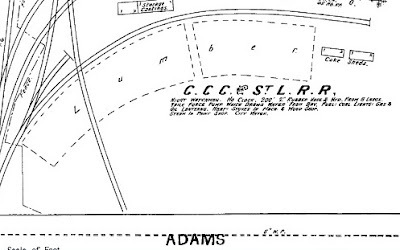 Some of the families who lived in this area included the Prentice, Wadsworth and Neill families. 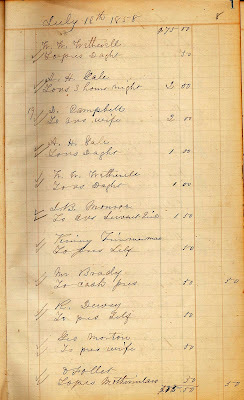 A description of Mustcash is found on page 37 of History of the Descendants of the Families of Ira Barnes, Hiram Barnes, Richard Wadsworth and Levi Prentice of Mustcash, Ohio : From 1817 to 1913, by N.E. Prentice, (Payne, Ohio, 1913). the author describes the area as “the point of land that extends into Sandusky Bay on the south shore.” It was first called Mustcash Point, and then the word “Point” was dropped. 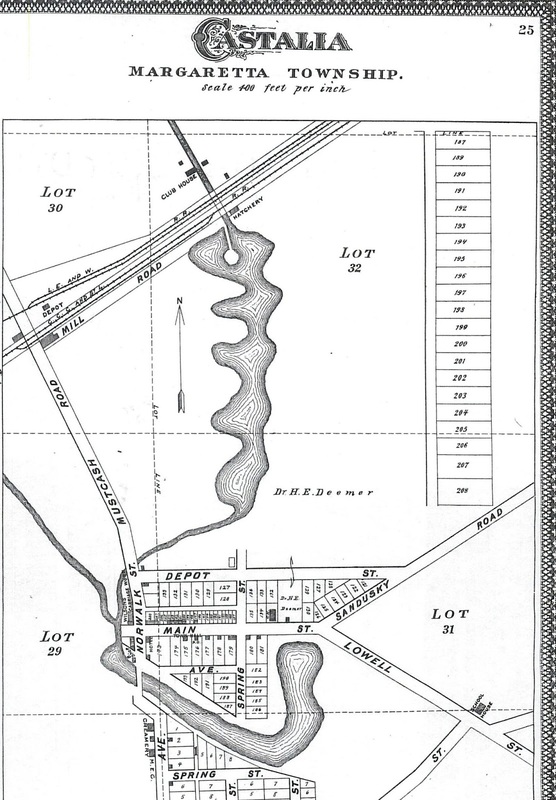 The area considered Mustcash eventually included the land of the families living further back from the water, along what is now Wahl Road. 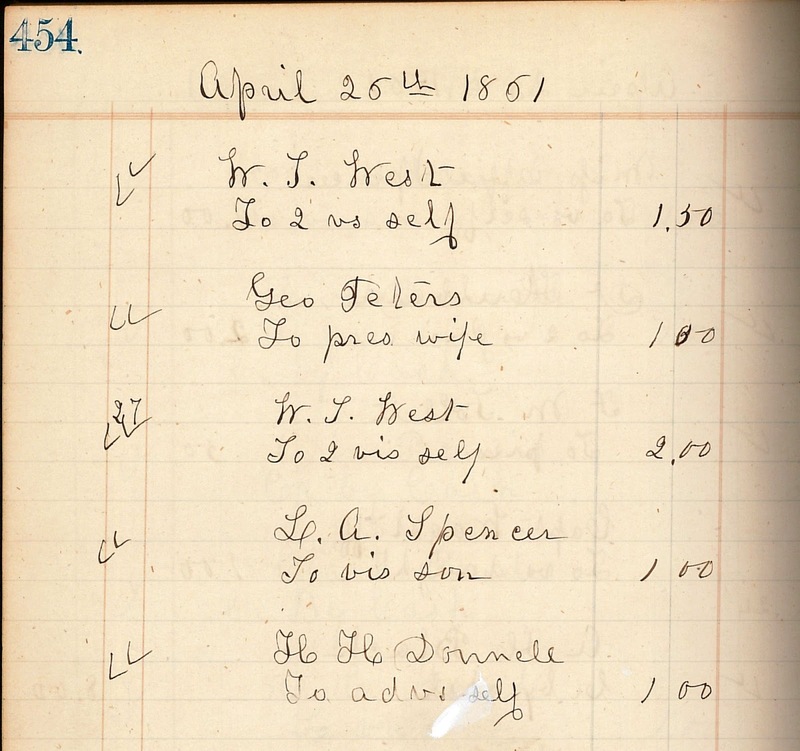 (Note: People have argued about the exact location of Mustcash for over one hundred years.) 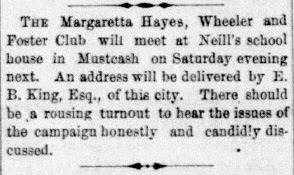 This brief article from the September 13, 1876 issue of the Sandusky Register tells us that the Margaretta Hayes Wheeler and Foster Club was to meet at Neill’s school house in Mustcash to discuss the election of 1876. Rutherford B. Hayes did indeed win the presidential election, with William A. Wheeler serving as his Vice President. 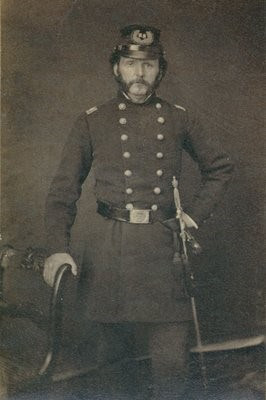 Republican Charles Foster served four terms in the House of Representatives, and later he was Ohio’s Governor, in office from 1880 to 1884. The Mustcash congregation was later combined with the Lutheran church in Castalia, now Grace Lutheran Church. Henry C. Millott was born in Erie County, Ohio in 1878 to Martin and Julia (Tracy) Millott, who were both of Irish descent. Mr. Millott worked as an architect in Sandusky for over fifty years, in partnership with Harold Parker for much of that time. 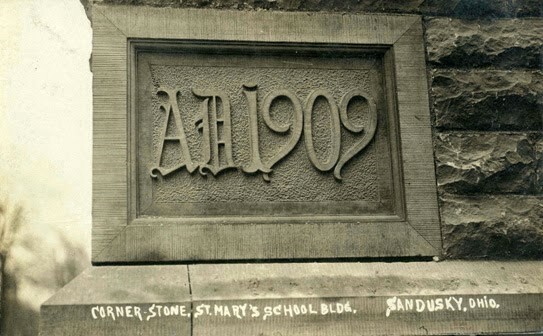 He was the architect for St. Mary’s Catholic School, which was dedicated in 1909. 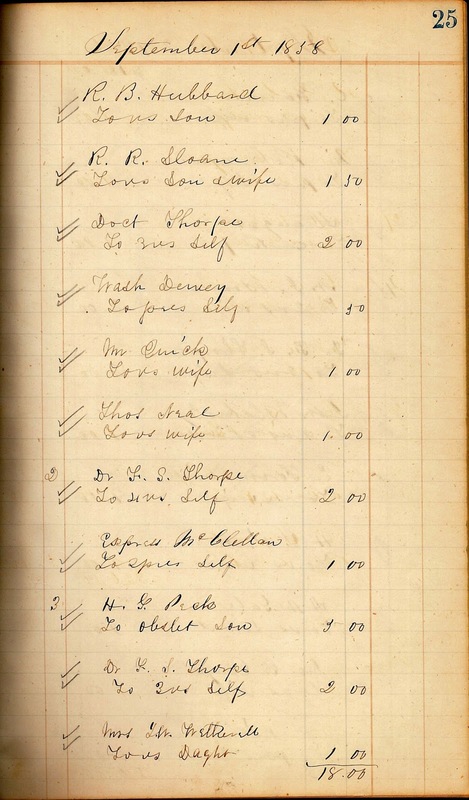 In 1915 Mr. Millott designed an addition to the Hotel Rieger. 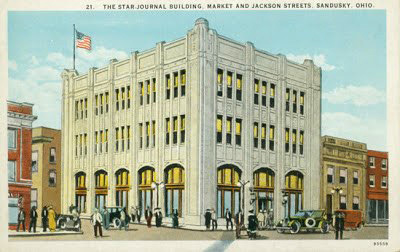 He was also the architect for the Sandusky Star-Journal building built between 1920 and 1921 at the southeast corner of Market and Jackson Streets, now home to the Sandusky Register. Two financial buildings were constructed in Sandusky in 1923. 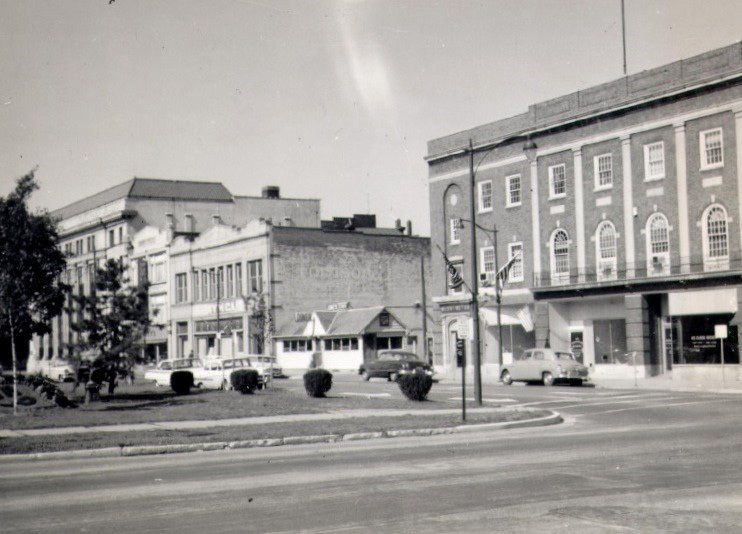 Mr. Millott was the architect of the Third National Exchange Bank on Market Street, which was built in the Neoclassic style. Both Henry C. Millott and Harold Parker were listed as architects of the Commercial Banking and Trust Company, built at the corner of Columbus Avenue and East Washington Row. 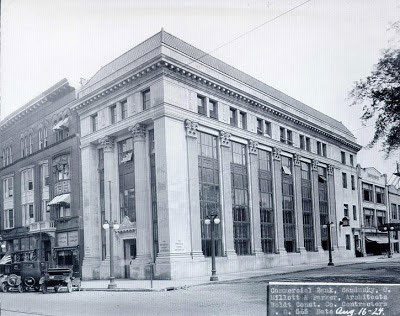 Ellie Damm wrote in her book Treasure by the Bay that the Commercial Banking and Trust Company is the only Beaux-Arts style building in the city of Sandusky. 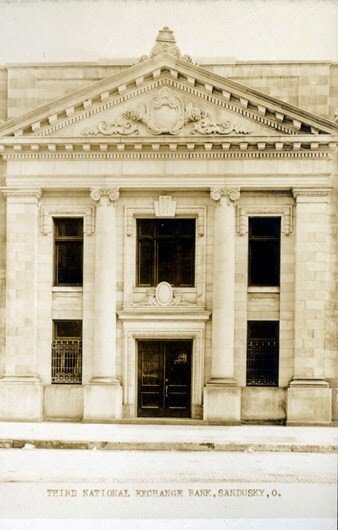 Note the carved cornucopias above the front door of the former Commercial Banking and Trust Company, which is a symbol of abundance. In 1938, Mr. Millott designed the Erie County Children’s Home, which was a federal Public Works Administration project. The August 10, 1939 issue of the Sandusky Star Journal reported that Henry Millott had been the “brain child” of renovation of the Erie County Courthouse project which took place in the 1930s. 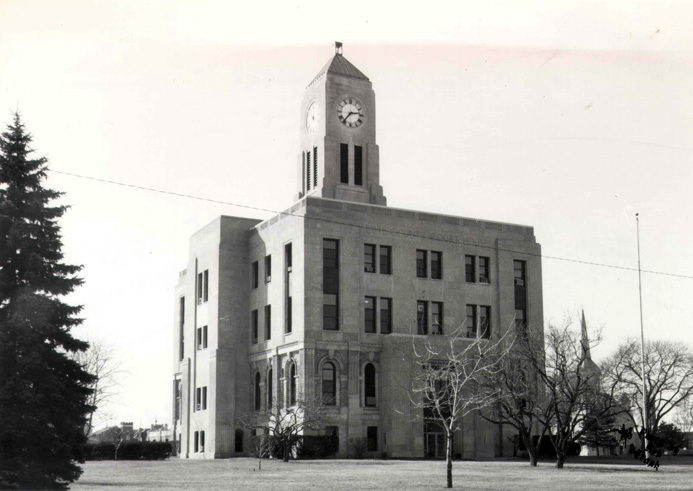 The courthouse renovation was completed without interrupting the normal activities of the courts. When Mr. Millott filled out his World War II registration card in 1942, he stated that his employer was the Trojan Powder company, for whom he worked as an architect. In 1946, the Bellevue Housing Company announced that he was the architect for twelve new homes to be constructed for U.S. veterans on lots purchased on Ellis Avenue, Sheffield, Walnut and Kern Streets in that city. Henry C. Millott died on June 20, 1957. He was survived by his wife, the former Eleanor Hinde, two daughters, three sons, and several grandchildren. 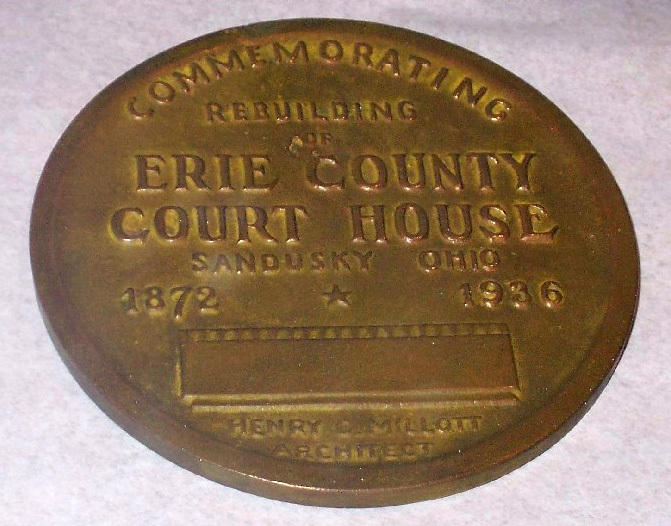 Through his architectural designs, Mr. Millott quite literally left his mark on Sandusky and Erie County. 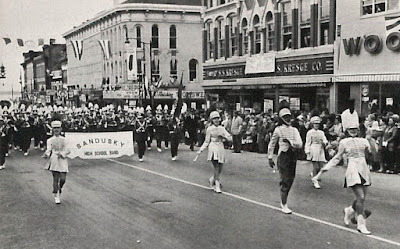 The Sandusky High School marching band is pictured above marching down Columbus Avenue in this photo from the 1963 Fram. At that time the Kresge Company and Woolworth’s were popular places to shop in downtown Sandusky. At the Sandusky Library, we have historic Sandusky High School yearbooks, the Fram, covering several decades. Visit the Sandusky Library to learn more about the classes and activities of Sandusky High School students from years gone by. You may see some familiar faces! In 1917 the first day of January occurred on a Monday, as it does in 2018. This calendar was a promotional item given away by Conrad Ebert, Jr.’s Avenue Pharmacy during the holiday season in December, 1916 and January, 1917. Mr. Ebert’s pharmacy extended from Columbus Avenue through to Hayes Avenue. 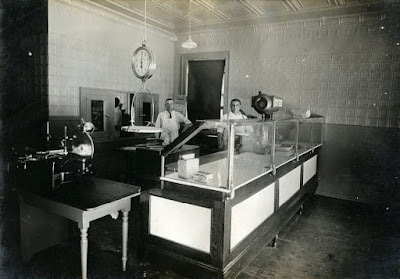 Below is an interior view of the drugstore. 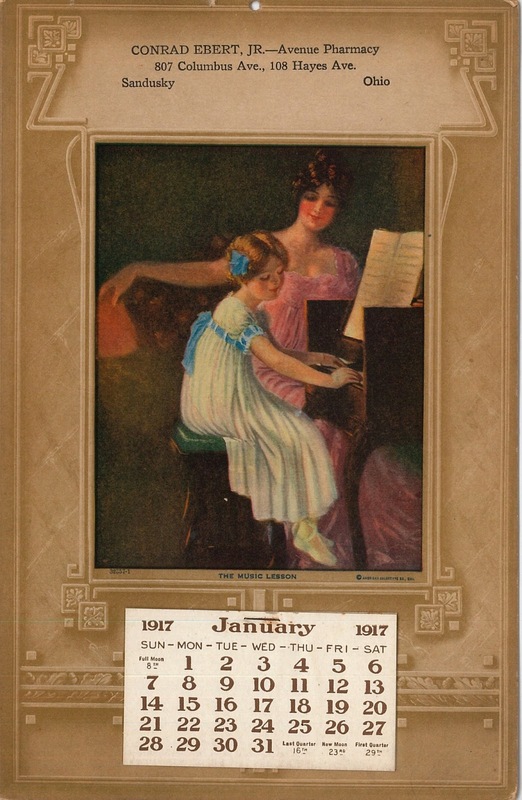 Wishing you a Happy New Year from the Sandusky Library Archives Research Center and Follett House Museum!